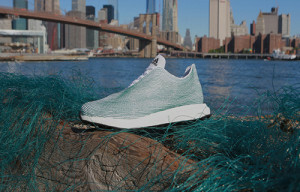 Sports brand adidas recently announced a partnership with Parley for the Oceans and showcased a footwear made of plastics waste collected from the ocean. On June 30, Parley Talks titled “Oceans. Climate. Life.” were hosted by the United Nations (UN) in New York, the US at the General Assembly Hall, on the occasion of a high-level event on climate change, convened by the President of the General Assembly. Parley for the Oceans is an organization aims to raise awareness about the state of the oceans and to collaborate on projects that can protect and conserve them. At the UNxParley event, global sports brand adidas, a founding member of Parley for the Oceans, created the world’s first running shoe upper that is made entirely of yarns and filaments reclaimed and recycled from ocean waste and illegal deep-sea gillnets. Parley partner organization Sea Shepherd retrieved the nets after a 110-day expedition tracking an illegal poaching vessel, which culminated off the coast of West Africa. adidas is also expected to introduce a consumer-ready ocean plastic products later this year. “We are incredibly excited to join Parley for the Oceans as they bring the cause of the oceans to the attention of the United Nations. This partnership allows us to tap into new areas and create innovative materials and products for our athletes. We invite everyone to join us on this journey to clean up the oceans,” said Eric Liedtke, adidas Group Executive Board member responsible for Global Brands.